DevExpress is a software development company that specializes in software technology research, component and add-ins creation for different platforms. It was founded in 1998 with headquarter in Glendale, California. Developer Express generates business application frameworks, different controls and libraries. The company develops components and assistant tools for ASP.NET, Silverlight, WinForms, WPF, Windows 8 XAML, HTML, JS, VCL. Besides efficient products’ creation, DevExpress provides high-quality professional customer support and has tutorials and documentation in open access. 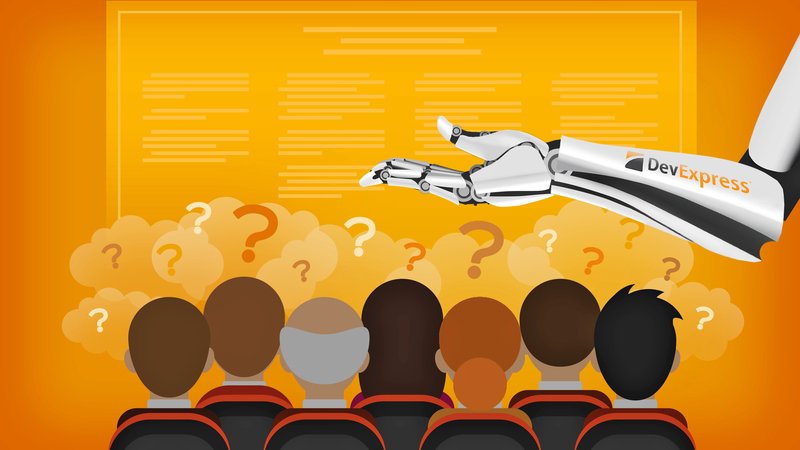 At the very beginning, it was a small group of developers striving to create their own products based on Delphi. The goal was to assist users in development Microsoft Office-inspired solutions easily with the help of Data Grid and TreeList controls, Sidebars, Toolbars and Menus. And, as DevExpress was always aimed at taking care of the customer first, it quickly became the market leader in VCL User Interface Control. In the evidence of its leadership in VCL market DevExpress becomes four-time winner of Delphi Informant's Best VCL Component award. So, the next step is to focus on Microsoft developer community. Thus, Developer Express creates the XtraGrid - UI control suite for .NET WinForms – and becomes the first vendor for .NET UI Control Library. After that such products as ASP.NET WebForms, WPF, ASP.NET MVC, and Silverlight appear. Also, DevExpress introduces the Universal subscription - a best-seller toolset for .NET developers. Every decade and even every year the new trends appear. The task of company is to follow the new trends and provide users with smart solutions according to their current needs. DevExpress does its best to be always up-to-date. DevExpress offers 19 products (15 of them are different controls) and 2 multi-platform packages, so the user can find his perfect option for the particular need or choose the appropriate set. You can try products before buying. DevExpress provides developers and end-users with the access to demo pages and a 30 days free product trial, so there is a great possibility to understand whether the product intelligible and meets all the requirements. DevExpress are so confident in their products that offer 60-days unconditional money back guaranty for their products. 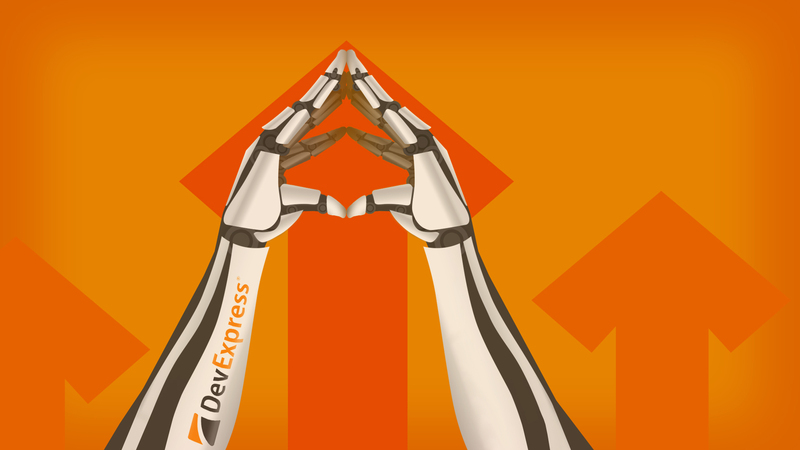 Developers claim that DevExpress controls are more clear and optimized in comparison with its competitors’ products. Moreover, thanks to an intuitive API the company’s tools are handy when setting up in every scenario. Documentation for every product is rather extensive and comes together with a lot of examples and case studies. Service support provides clear answers and available from Monday to Friday between 7:30 am and 4:30 pm Pacific Time by e-mail clientservices@devexpress.com or call +1 (818) 844-3383. There is the reason why we call Developer Express one of the leaders among Third Party Components developers. To be precise, there are 200 reasons for that - in 20 years of its existence, the company has won 200 awards yet. Many of these awards are the first places determined by developers’ votes. 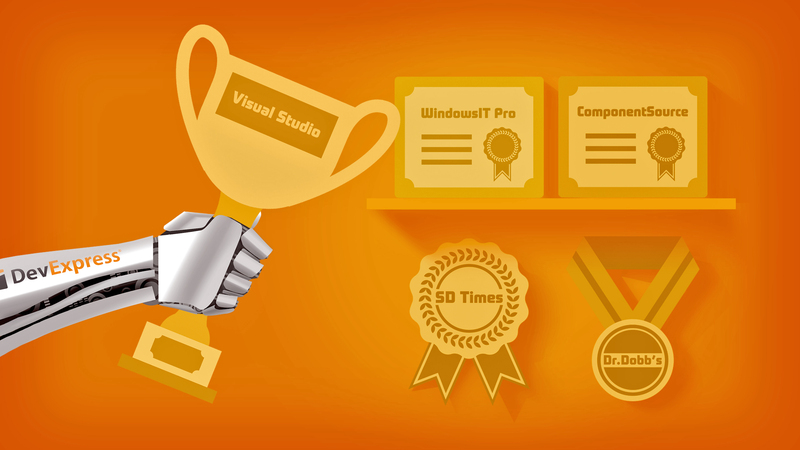 Visual Studio Magazine Reader's Choice Awards: in 2017 DevExpress became the best in Class Tools for 19 time. Dr. Dobbs Jolt Awards: 2014 - Universal Subscription became Jolt Award winner in the Best Programmer Libraries Category, CodeRush - finalist of Jolt Award in the Software Coding Category; 2012 – DevExpress won in Coding Tools and Third Party Libraries productivity awards; 2007 - CodeRush won in Productivity category. Best of TechEd Awards: 2014 - Software Development category winner; 2011 - Software Development category winner; 2009 - Business Intelligence and Overall Attendees' Pick winner; 2008 - Breakthrough Product and Overall Attendees' Pick winner; 2007 - Attendees' Pick for Web Development and Infrastructure winner. CodeProject Members Choice Awards: 2012 - the company won in Best .NET Components, Best Data Visualization and Reporting, Best Code Generation categories; 2011 - ASP.NET UI Components, Charts and Graphing, Best Component Libraries and General Development Tools categories; 2010 - ASP.NET UI Components, General Development Tools categories; 2009 - Best Component Libraries category. Best of Connections: in 2011 won awards in the Best Visual Studio Product category. The company also won silver in Best ASP.NET/Silverlight Product category. Windows IT Pro Community Choice Awards: 2014 – Universal Subscription won in Best Software Development Suit category; in 2009 DevExpress got second place awards in Best Development Tools category and third place in Business Intelligence and Reporting Tool category. ComponentSourse.com named DevExpress the best-selling publisher and its top product - DXperience the best-selling product for eight years in a row (from 2010 to 2017). SD Times included DevExpress into the list of 100 Influential Software Companies in 2004 and then the company was in the list another 11 times from 2007 to 2018.
asp.netPro Readers’ Choice Award: 2004-2009 – DevExpess products won 34 awards in such categories as Product of the Year, Best Grid, Best Chart, Best Add-in, Best Navigation Control, Best Component Set and others. DevExpress WinForms is a software package that includes 160 powerful controls and UI libraries for Windows Forms platform. Optimized tools allow programmers to develop highly customizable applications that meet specific business objectives. DevExpress WinForms offers clickable controls, dozens themes for applications and features enhanced performance. 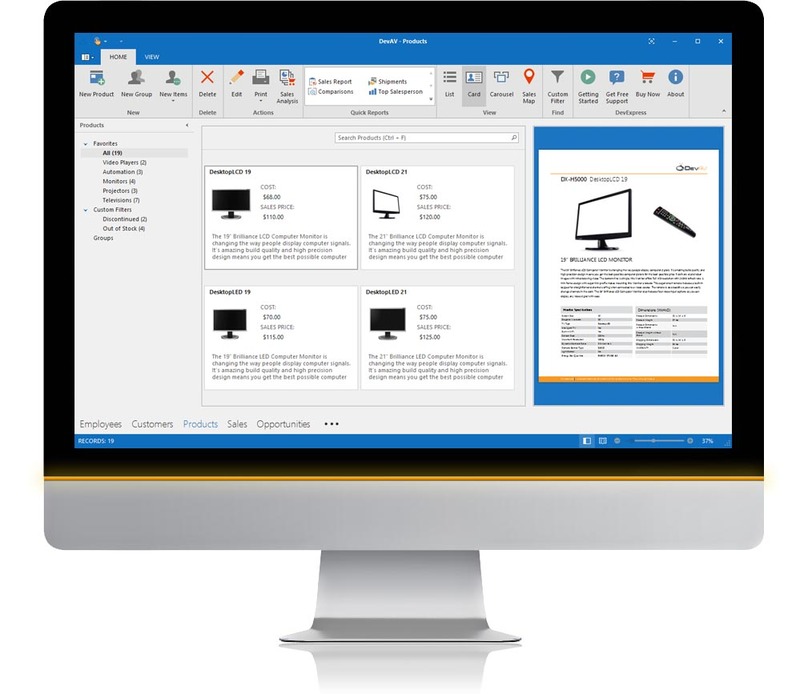 DevExpress WinForms package includes: XtraPivotGrid Suite, XtraBars Suite, XtraGrid Suite, XtraEditors Library, XtraScheduler Suite, XtraLayoutControl Suite, XtraReports Suite, XtraTreeList Suite, XtraVerticalGrid Suite,XtraSpellChecker, XtraCharts Suite, XtraNavBar and XtraPrinting Library. DevExpress ASP.NET WebForms offers optimized tools such as printing, charting, reporting, cheduling, grid and data editors, calendars, HTML editor, TreeView-ListView, pivot grid and analytics, menus, toolbars, multi-purpose controls, navigation bars, spell checking and an ORM Library. If you are targeting the MVC platform, DevExpress ASP.NET includes collection of ASP.NET MVC Extensions (Spreadsheet, Rich Text & HTML Editors, Card View, Ribbon, Vertical Grid) and Core Controls (Gauges, Range, TreeMap and Chart controls) which let you to build office-inspired applications. DevExpress VCL is a software package that includes easy-to-use controls and libraries for Delphi and C ++ Builder. DevExpress VCL is based on a proprietary server-side data processing technology, allowing users to view and analyze data at high speed no matter the data size is, so developers don’t have to reduce the feature set. VCL allows you to emulate the look, behavior and capabilities of Microsoft Office, copy the UI of Visual Studio, Adobe Photoshop and other applications. With the help of Tile Control, Adorner Manager, Camera and Barcode Controls your UI will continue to evolve. DevExpress CodeRush is an add-in for Visual Studio that allows you to optimize the process of code writing, find and fix defects and easily refactor the code. This product visualizes complex code and makes debug easier. CodeRush navigation helps move to the right place in the code quickly and accurately. It also conducts codes rapid testing and identifies duplicate parts of the code. TestCafe is operating system, which allows you to test in every browser that supports HTML 5 whether it is Safari, Firefox, Chrome, Opera or others. Users can run tests on mobile devices or remote computers, no matter whether it is Windows, Mac or Linux machines. DevExpress TestCafe allows running tests in multiple browsers and on multiple machines in parallel. The product includes script injection that gives opportunity to communicate directly with the intercept user actions and webpage DOM. 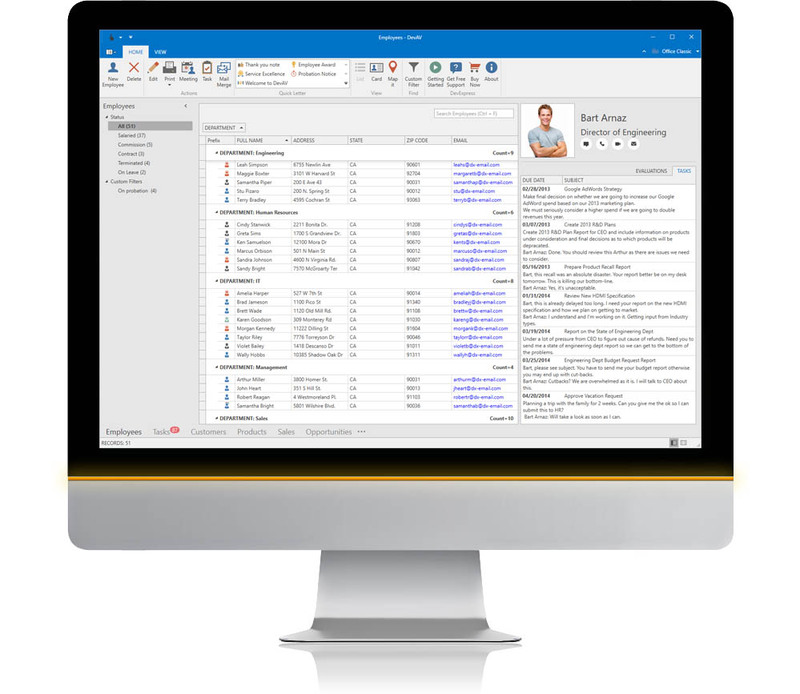 So eliminating out-of-process browser plug-ins, TestCafe puts control right in your hands. XAF (eXpressApp) is a business application framework generated to develop applications for Windows, Web and Mobile. EXpressApp Framework contains built-in support for MS Entity Framework and DevExpress eXpress Persistent Objects (XPO) ORMs and includes support for the most featured database engines. With the help of XAF you can define the data model manually in the code or with a visual scheme designer. Moreover, XAF will automatically create the complete, customized UI based on your data model. With any change according user’s needs and context of use, the data model and User Interface will also change. 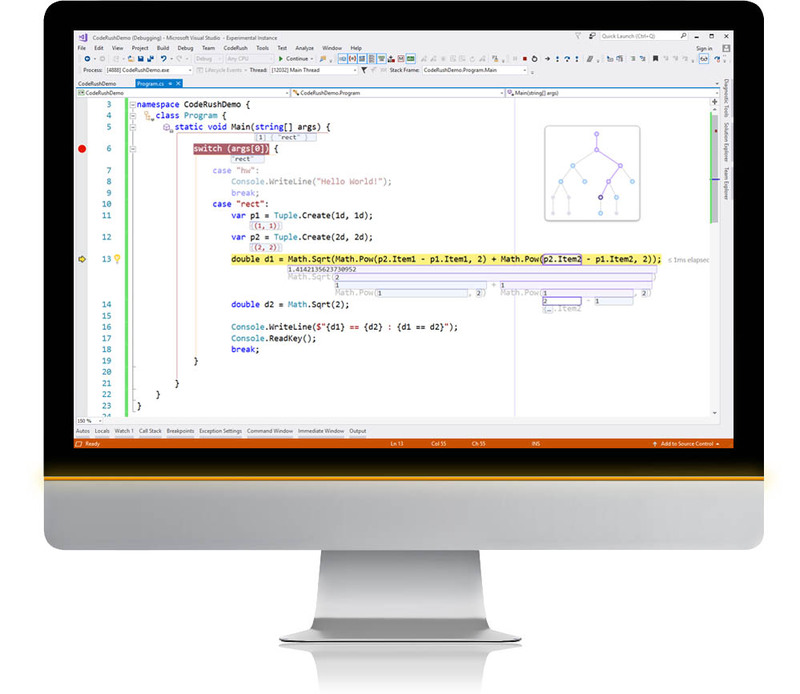 DevExpress WPF is a software package that includes 110 controls and libraries for developing applications on the Windows Presentation Foundation platform. Optimized tools help to develop highly customizable applications that meet specific business objectives. DevExpress WPF offers more than 20 applications themes and allows you to optimize the interface for both desktops and touchscreens. WPF also has a Model-View-ViewModel (MVVM) structure for building flexible applications for WPF and Silverlight. DevExtreme includes such components as data grid, data editors, pivot grid, interactive charts, navigation and multi-purpose widgets that designed with the great interface and provide you with powerful functionality in any browser. DevExpress Universal is a complete software development package for .NET developers. It helps you build applications for Windows, Web, mobile and tablet. DevExpress Universal Subscription includes source code for all WinForms, DevExtreme HTML5 Widgets, ASP.NET, WPF, Dashboard and Windows 10 Apps controls. Galaktikasoft is one of DevExpress technology partner. Their close cooperation connected with Galakticasoft Xafari and DevExpress XAF products. 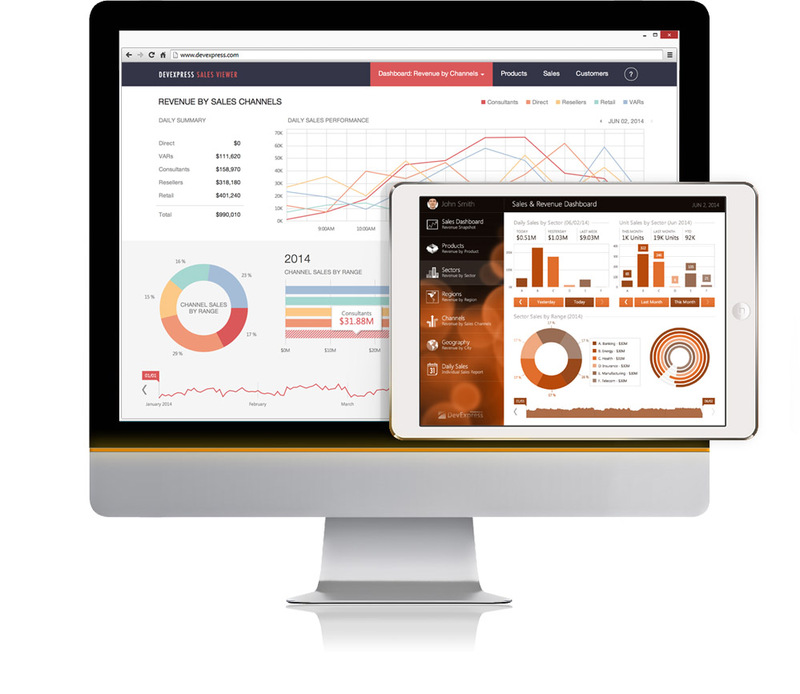 Xafari is a business platform generated in order to build advanced business applications with an n-tier architecture. It was created to extend XAF capabilities and is fully based on the eXpressApp Framework. XAF and Xafari have a big collection of pre-built vertical market solutions and a number of generic extensions that is why developers and end-users choose them. 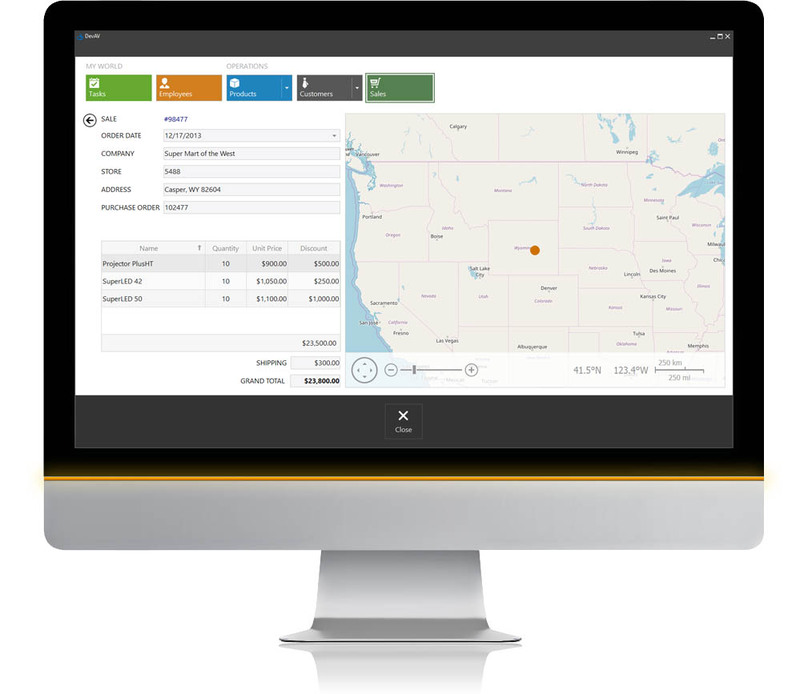 The products include dozens ready modules including exporting, reporting, mapping, charting, scheduling and others. For more info about XAF and Xafari frameworks, refer to DevExpress XAF Framework: an effective tool for business app development. 1. What is DevExpress and how is it connected with Visual Studio and ASP.NET? DevExpress is a software development company that creates customized controls, tools and add-ins for different platforms. Developer Express directly connected with Visual Studio and ASP.NET as the company extends their capabilities. DevExpress provides Visual Studio with CodeRush – useful add-in that can optimize the code writing process, find and fix defects and easily refactor the code. As for ASP.NET they offer ASP.NET WebForms and ASP.NET MVC & Core that extend platform’ options. The company creates components and assistant tools for WinForms, ASP.NET, WPF, Silverlight, VCL, Windows 8 XAML, HTML JS. 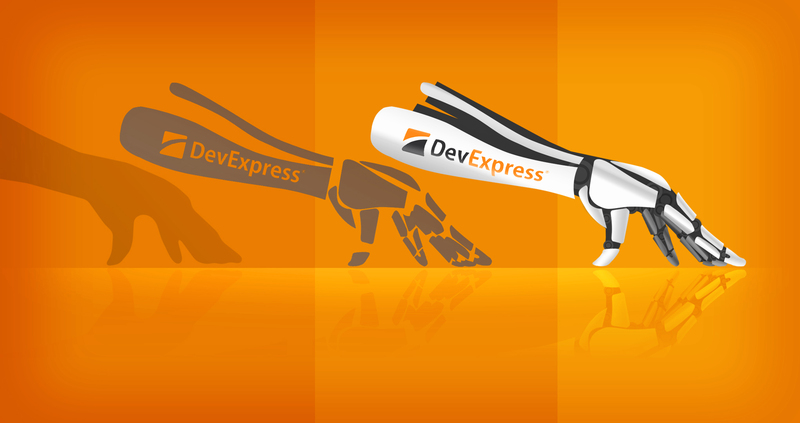 Thus, DevExpress focused on optimization of controls, server tools, frameworks, testing processes. They have a wide range of products – 19, and 2 multi-platform packages. Besides, DevExpress allows using tutorials and documentations and has a support center. 3. Can I use standard ASP.NET controls with the DevExpress framework? Definitely, you can: DevExpress presents ASP.NET WebForms and ASP.NET MVC & Core Controls that can be useful when working with basic ASP.NET controls. 4. Are there any detailed and free trainings or tutorial available for DevExpress? On DevExpress official website, in every product section, there are articles, case studies, tutorials or documentation that can help you to better understand it and provide information of how to use each product. Moreover, Developer Express has its own YouTube channel with lots of training videos. 5. Can I try product before buying? Developer Express offers 30-day free trial for every product and demo for some of them. What is more, DevExpress provides 60-days unconditional money back guaranty for their products. So, even after buying, you still have chance to refuse in case the product doesn’t suit your requirements. 6. What should I do if I need several DevExpress component? There are two multi-platform packages that include from 12 to 17 DevExpress products. Choosing them, you have all the necessary tools together. 7. How can I upgrade a project in DevExpress? The world is not ideal. Moreover, people are different: everyone has his one needs, requirements and expectations. That is why software and platforms cannot be ideal too. They require extensions and add-ins in order to satisfy the particular user needs. Galaktikasoft team consider DevExpress solutions as leaders to solve above mentioned problem. The wide range of their products allows choosing efficient solution on your precise request.